El Monte RV have an excellent fleet of Burning Man rentals, but RV’s can be difficult to drive if you’re not familiar with large vehicles. Driving out after a week of extreme partying has its challenges too. 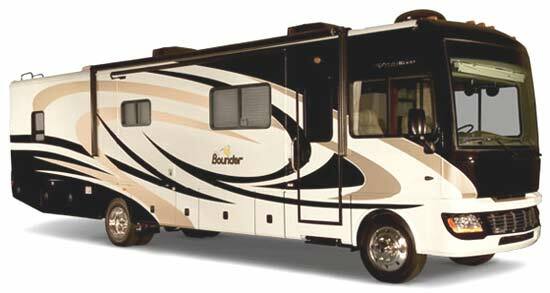 For 2012, El Monte are offering a luxury RV package which includes delivery of your motorhome to your camp at Burning Man. You can even order your provisions online from Vons to be sent to their depot, and your RV will be fully stocked when you get it. 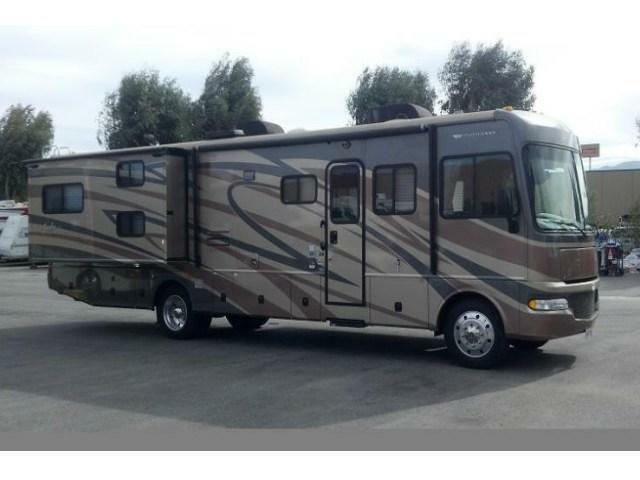 El Monte RV will deliver a Class A motorhome to Black Rock City. Our staff will meet you at a pre-determined area at BRC and direct our driver to drive you and your motorhome to your camp. Worried about what you will need to bring? Don’t worry, shop online instead. Vons is a statewide supermarket chain offering online shopping and delivery to our facilities near Los Angeles. Simply have your online grocery order shipped to us by 2:00 pm two days before your delivery and we’ll stock everything in the motorhome. Entertainment: 27″ and 20” flat screen TVs, DVD player and stereo radio with CD player. Facilities: Full bathroom with large walk-in shower, dual roof air conditioning units, 120V generator, heating, fresh water tank with a water softener and grey and black water holding tanks. Entertainment: 27″ flat screen TV, DVD player and stereo radio with CD player. Accommodations: 5 sleeping areas including bunk beds and two spacious slide-out sections. Facilities: Full bathroom with walk-in shower, dual roof air conditioning units, 120V generator, heating, fresh water tank and grey and black water holding tanks. Provisions: 3/4 tank of fuel (approx 56 gal. ), full tank of fresh water (85 gal. ), full tank of propane (25 gal.). Kitchen kit: Provides all the necessary Kitchen and Cooking items you’ll need. Four beach cruiser style bicycles. Mid-size cooler (customer may purchase ice at BRC). Standard cleaning on retrieval (additional charges may apply for excessive cleaning or damages). A Black Rock City camp location is required for delivery. We will stage your motorhome at your camp, set it up for you, and give the keys to your contact person in BRC. Our driver will arrive on the date and time you designate to pick up the motorhome. Delivery to BRC can be scheduled between 10:00 AM and 6:00 PM. on Monday (8/27) through Thursday (8/30) and retrieval can be scheduled between 6::00 AM and 6:00 PM. on Sunday (9/2) or Monday (9/3). We can transport your party in your motorhome to BRC from the Grand Sierra Resort Hotel and Campground at 2500 East 2nd Street Reno, NV 89595 on the day of delivery to BRC. You must arrange your own transportation from the Reno Airport to the Grand Sierra Resort Campground. Drive times to BRC from Reno vary from 3-4 hours or longer. On your retrieval date, we will pick up the motorhome and transport your party back to the Grand Sierra Resort Campground. You must arrange your own transportation to the Reno Airport. Drive times from BRC to Reno vary from 4-8 hours depending on traffic conditions exiting BRC. Early morning departures from BRC provide the best guarantee of the shortest trip from BRC to Reno. Be sure to plan your flight arrival and departure times according to these estimated drives times to and from the Reno airport. 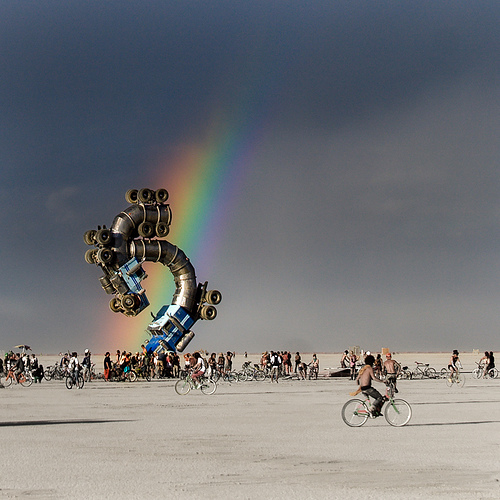 We are looking for 2 motor homes for for burning man 2016. The motor homes need to be 36 feet plus.